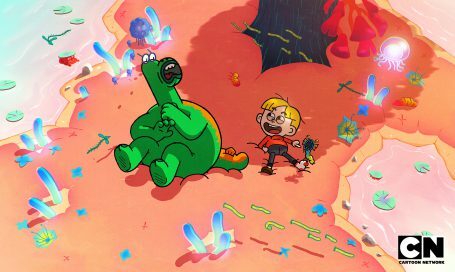 Turner’s Cartoon Network announced today the greenlight of an all-new original series, Elliott From Earth, from the UK-based team behind its global hit The Amazing World of Gumball. Elliott from Earth is a 20 x 11-minute animated sci-fi sitcom that offers a uniquely funny and warm-hearted perspective into the everyday life of kids – whether they’re human or not. Elliott is a human boy who finds himself living on a spaceship full of aliens from all parts of the universe. It’s a show about finding your place in the world, even if it’s in outer space. Oh, and there’s a dinosaur. Set to begin production in September 2018, Elliott From Earth is the newest Cartoon Network Original to be produced out of the network’s EMEA hub, and the latest from the pool of talent working on The Amazing World of Gumball. It is created by Guillaume Cassuto – formerly a scriptwriter and composition supervisor on Gumball – with the acclaimed Gumball scriptwriting, storyboarding and editing team lined-up to bring the show to life.